“The ocean can seem like an acoustically disorienting place, with muffled sounds from near and far blending together in a murky sea of noise. 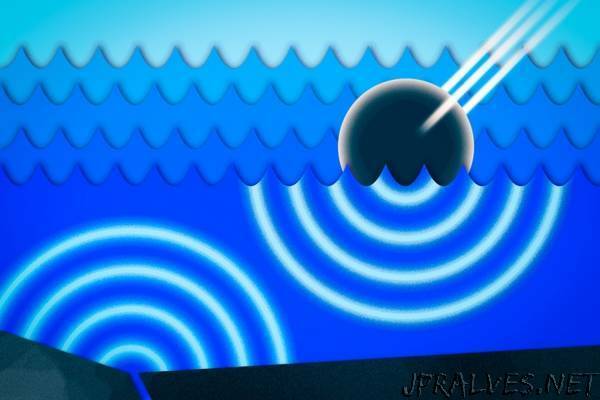 Now an MIT mathematician has found a way to cut through this aquatic cacaphony, to identify underwater sound waves generated by objects impacting the ocean’s surface, such as debris from meteorites or aircraft. The results are published this week in the online journal Scientific Reports. Lead author Usama Kadri, a research affiliate in MIT’s Department of Mathematics, is applying the team’s acoustic analysis in hopes of locating Malaysia Airlines flight 370, an international passenger plane that disappeared over the southern Indian Ocean on March 8, 2014. Since the aircraft’s disappearance, authorities have confirmed and recovered a few of the plane’s parts. However, the bulk of the aircraft has yet to be identified, as has any reasonable explanation for its demise. Kadri believes that if the plane indeed crashed into the ocean, it would have generated underwater sound waves, called acoustic-gravity waves, with a very specific pattern. Such waves travel across large distances before dissipating and therefore would have been recorded by hydrophones around the world. If such patterns can be discerned amid the ocean’s background noise, Kadri says acoustic-gravity waves can be traced back to the location of the original crash. In this new paper, Kadri and his colleagues have identified a characteristic pattern of acoustic-gravity waves produced by impacting objects, as opposed to other sources such as earthquakes or underwater explosions. They have looked for this pattern in data collected by underwater microphones near Australia on March 8, 2014, within the time window when the plane disappeared. The team picked out two weak signals likely produced on that date by two ocean-impacting objects. The researchers determined, however, that the locations of these impacts were too far away from the course that the plane is believed to have taken. Instead, the impacts may have been produced by small meteorites falling into the sea. Kadri says that if the entire plane had crashed into the ocean, it would have produced a much stronger, clearer signal. The paper’s co-authors include researchers from Cardiff University, where Kadri also serves as a lecturer, and Memorial University of Newfoundland. Acoustic-gravity waves are sound waves that are typically produced by high-impact sources such as underwater explosions or surface impacts. These waves can travel hundreds of miles across the deep ocean at the speed of sound before dissipating. Kadri and his colleagues carried out experiments to see whether objects hitting the water’s surface produced a characteristic pattern in acoustic-gravity waves. They dropped 18 weighted spheres into a large water tank, from various heights and locations, and recorded the resulting acoustic-gravity waves using a hydrophone. For each impact, the team observed a similar sound wave profile, consisting of three main parts. The researchers then developed a mathematical model to relate a particular pattern of acoustic-gravity waves to certain properties of its source, such as its original location, time of occurrence, duration, and speed of impact. They found the model accurately calculated the location and time of two recent earthquakes, using acoustic-gravity wave data from nearby hydrophones. After verifying the model, the team used it to try and locate evidence of the Malaysia Airlines plane crash. The researchers first looked through data from the Comprehensive Nuclear-Test-Ban Treaty Organization’s three hydrophone stations off the coast of western Australia. The data were collected within an 18-hour time window on March 8, 2014. The researchers focused on a two-hour period, between 0:00 and 02:00 UTC, during which the plane is believed to have crashed in the southern Indian Ocean. They identified two “remarkably weak” signals, according to Kadri, each with an acoustic-gravity wave pattern similar to those created by impacting objects. The first event was recorded only a few minutes after the last transmission time between the aircraft and a monitoring satellite. However, the researchers determined the event occurred about 500 kilometers away from the plane’s last known location. The aircraft would have had to fly faster than 3,300 kilometers per hour for nine minutes — an unlikely scenario. Given the timing and locations of the two events, however, it is more likely that they were generated by falling meteorites. As the team notes in their paper, between 18,000 and 84,000 meteorites bigger than 10 grams fall to Earth each year. If the two signals were indeed produced by meteorites, they would have been relatively large in mass. The team has submitted its analysis to the Australian Transport Safety Bureau, which led the investigation into flight 370. In the meantime, the researchers plan to apply their method to locate and study other acoustic-gravity wave sources.